The Brazilian comic series Monica’s Gang features a green-colored Lhasa Apso named Fluffy which belongs to Jimmy Five. In the animated series Spider-Man and his Amazing Friends, Peter’s Aunt May owns a lhasa apso named Ms. Lion. Lhasa Apso has also appeared in at least one episode of the Simpsons. In the episode Three Gays of the Condo, Homer Simpson moved in with a couple of gay men. Homer started to act like a gay man and got a Lhasa Apso. Also, Milhouse Van Houten owns a lhasa apso. In “The L Word”, Helena is assured by her wealthy mother that she was going to leave her inheritance to her, not to her Lhasa Apsos. Lhasa Apso are said to bring luck, hence the saying “Lucky Lhasa”.“. Singer Arturo Paz owns a Lhasa Apso named Coco, seen on Tiger Beat. Actress/Singer-Songwriter Keke Palmer has a Lhasa Apso named Rusty, seen in a picture on MTV Cribs. A Lhasa Apso is both a major character and a plot device in the Newbery Award-winning 1948 children’s novel, Daughter of the Mountains, by Louise Rankin (ISBN 978-0140363357). Singer Gwen Stefani had a Lhasa Apso dog called Lamb/Meggan. 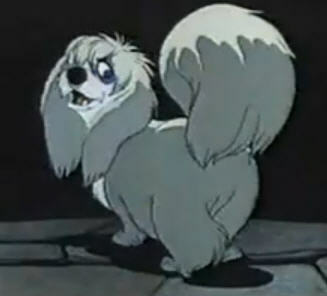 A Lhasa appears in Disney’s animated feature film Lady and the Tramp as the pound dog Peg.